So much to do as the weather gets better. 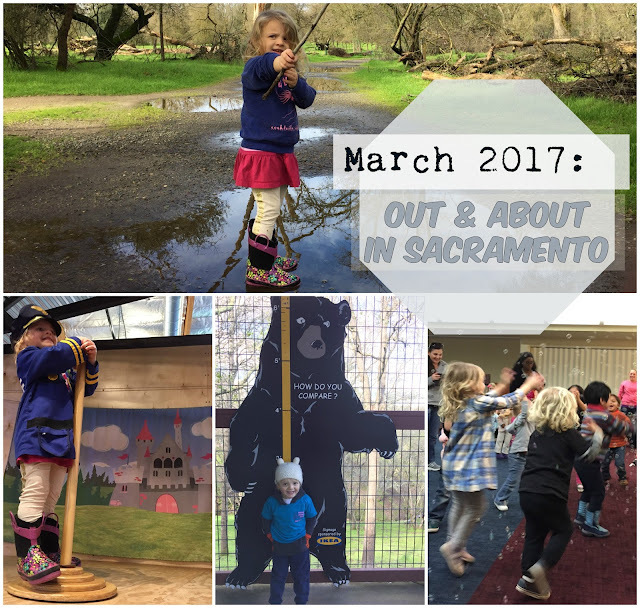 Here are some great things to do this month with your kids! Check them out. And anything I forgot - leave in the comments. March 2: Seuss-abrate! - It is Read Across America Day and Dr. Seuss' birthday so celebrate at the library! Arden-Dimick is having an event in the afternoon that would be fun to check out. March 7: Tuesday Trains - Tuesday Train rides are back at the Train Museum. Every Tuesday from March 7 thru May 2. Check it out. Kids under 5 are free - Adults are $12 and kids 6-17 are $6. March 11: March Second Saturday - Peter Pan - Join the Sacramento Ballet for an afternoon of fun with Tinkerbell and Peter Pan for Second Saturday. I'm hoping to take Lucille to more dance stuff since she is loving her tap and ballet lessons. This might be a fun one to start with. March 12: March Hare Madness - Join a Naturalist for a hike at Effie Yeaw and learn all about rabbits that make their home along the parkway. Open for all ages. March 18: Tractor Family Fest - The California Ag Museum shows off its best stuff - and there is a Kid's Corner. Kids under 5 are free to this unique Woodland museum. It's really worth checking out. Especially if you have a kid that likes big machinery. March 18: St. Patrick's Day Parade - If you're looking for some green, St. Patty's Day fun over this weekend - head to Old Sacramento for a St. Patty's Day parade that would be fun for the whole family. March 19: Birds & Breakfast Weekend - For kids 6+ - Effie Yeaw Nature Center is having their annual Birds and Breakfast Weekend. It included continental breakfast and a short family bird walk. On Saturday they have a bigger, longer version for 12+ and adults. Either would be worth checking out if you've got nature loving kids in those age ranges! March 29: Peppa Pig Live! - We saw this show in Stockton last year and Lucille LOVED it. We did the VIP experience where she got to meet Peppa afterwards and everything. We probably won't do it again - although it is tempting. Maybe Gus would like it this year.